Iden Versio is a daughter of the Empire and she's pissed. The winners write the history books. When the second Death Star explodes over Endor in Star Wars Episode VI: Return of the Jedi, the Rebel Alliance rejoices. It's a thrilling moment of victory after eons of interstellar military adventuring: Forests full of weary Ewoks, droids and soldiers burst into cheers, throwing their arms in the air. But what did members of the Galactic Empire do? How did the Imperial soldiers on Endor feel as they watched their dreams of a stable galaxy burst into flames, right in front of their eyes? What did they think as they watched their friends die? This is where Star Wars: Battlefront II begins. Battlefront II is a bigger game than its predecessor, which launched as a multiplayer-only experience in 2015. 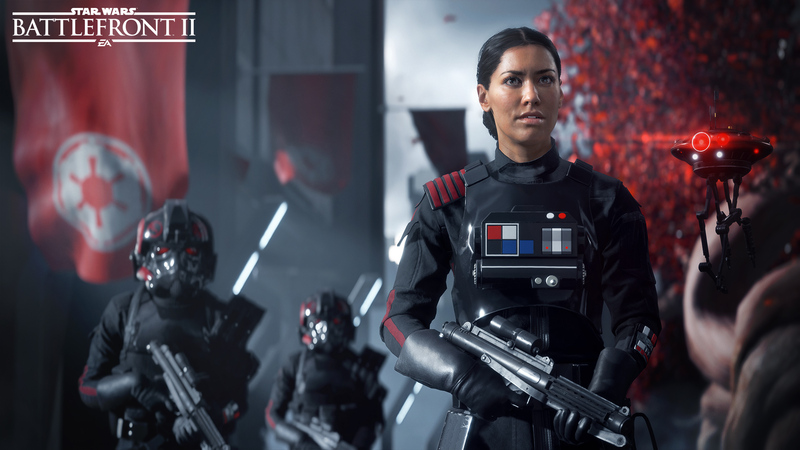 The sequel tacks on a campaign mode following Iden Versio, the daughter of staunch Imperial loyalists and a commander of the elite Inferno Squad. This is the Star Wars universe as seen from a new perspective, where the Galactic Empire is "good," and the Rebel Alliance is a violent and misguided effort. "We've heard a lot about the heroes of the Rebellion in the Galactic Civil War, and we wanted to give the Empire heroes," says Motive Studios Game Director Mark Thompson. Motive is a subsidiary of Electronic Arts helmed by venerated Assassin's Creed producer Jade Raymond, and it's not the only studio working on Battlefront II. Motive is collaborating with DICE (the home of EA's Battlefield series), Criterion (the folks who built the X-Wing VR Mission DLC for the first Battlefront) and Lucasfilm (no explanation required). Battlefront II is set to launch worldwide on November 17th for PlayStation 4, Xbox One and PC, though its first trailer ends with a plug for the PS4, suggesting some exclusive or early content on that particular system. Battlefront II fills in the 30-year gap between Return of the Jedi and The Force Awakens, starting right as the Death Star is blown to bits. Hordes of faceless stormtroopers are battling on Endor when Iden's elite team, the Inferno Squad, swoops in. She's fighting for her cause in head-to-toe black armor, when an explosion rocks the sky. She tears off her helmet in shock. "We began from the question of, what does it mean when you take off that helmet? And in a very different way than Finn in The Force Awakens," Lucasfilm Creative Executive Steve Blank says. "He takes his helmet off specifically to defect. But what does it mean for the day-to-day stormtrooper who believes in this, who is a part of this, what happens when they take off that helmet?" Thompson jumps in: "You take off the helmet in disbelief when you see the Death Star explode, and then you put it back on with a renewed determination. That becomes a powerful, character-defining moment." Iden's father is an admiral for the Empire, while her mother designs propaganda material for the same faction. She grows up on Vardos, an Imperial planet and society that she adores. Iden is a picturesque Imperial soldier who truly believes in the cause. "She is so committed, she is so invested, that she puts all of her energy into being the best within the Empire," Blank says. "So she ultimately gets to that top spot and becomes a special operative. She also carries with her all that it means to be a special operative: she is collected, she is focused, she is powerful and she is a commander." Iden is in charge of a small team of highly skilled stormtroopers and throughout the game, players will get to know these soldiers as well. Their helmets come off to reveal the human (and humanity) within. Iden leads this team across the galaxy — which means Battlefront II definitely has space battles. The ships in the sequel are designed to be as robust the heroes themselves; players will be able to customize their vessels just as they do their characters. Plus, some classic Star Wars vehicles have made their way into the game, including the Millennium Falcon. That's good, considering a large chunk of the game will involve flying. "It is a big part of [the game] because it is a big part of the Star Wars fantasy. Certainly the moments that I remember are these epic capital ships coming at the camera," says Criterion Games GM Matt Webster. "Those are the moments that you want to relive." Ship or no, Iden isn't the only playable character in Battlefront II. 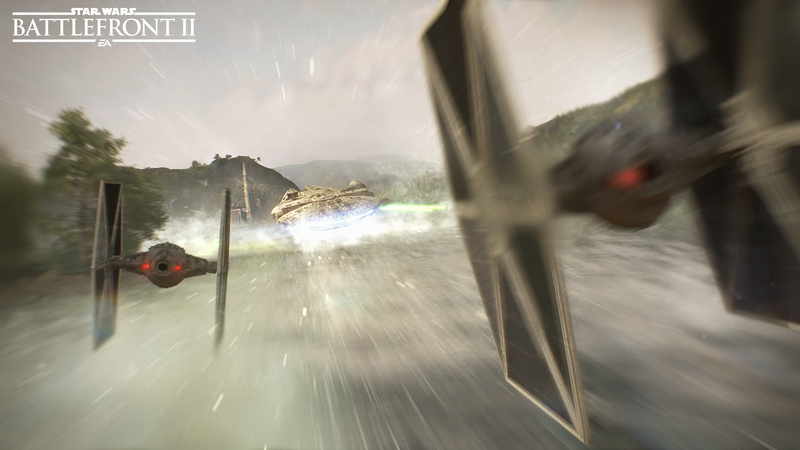 In the campaign mode, players will also control Alliance hero Luke Skywalker at times, introducing Jedi-based gameplay mechanics and abilities. These should come in handy in Battlefront II's multiplayer mode. Multiplayer mode offers a range of legendary Star Wars characters to play as, including Yoda, Darth Vader, Kylo Ren and Rey. It's also possible to play as various soldier forms, including as a droid or stormtrooper. To recap: Battlefront II has a rich story mode that humanizes the Empire, it features upgradeable abilities and customization options, and players will be in command of their very own space ships. All of that is nice, but none of it is the coolest part of Battlefront II (so far). That honor is reserved solely for the rideable Tauntauns.